“Confidence is a dirty word among Christians. We are taught to be humble and gentle, not confident. Confidence equals arrogance, and arrogance sends the wrong message.” Kristine Brown, Over It. Kristine’s words make me itchy. That kind of itch that hits your nose when your hands are full. Inconvenient. Bothersome. Demanding attention. Confidence versus arrogance. 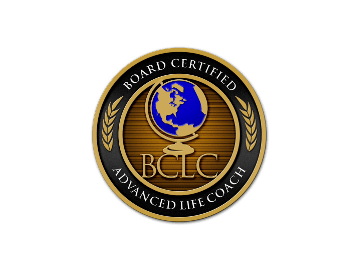 A messy little competition that plays out within. Weakening our resolve to follow God, because we don’t want to be full of pride. All good Christian girls know that pride comes before a fall, and Lord knows, we worry enough about falling. Kristine’s book is about conquering comparison. She asks the question, “Is it possible to silence the voice of comparison in your life?” She takes us along on a journey through the lives of several women in the Bible, as well as several women who are in the here and now, girls who obviously have read my mind. I find my heart splashed on page after page. Comparing myself to others – weight, intelligence, education, gifting, wifeing (is that a word), mothering…you understand, you’ve been there. 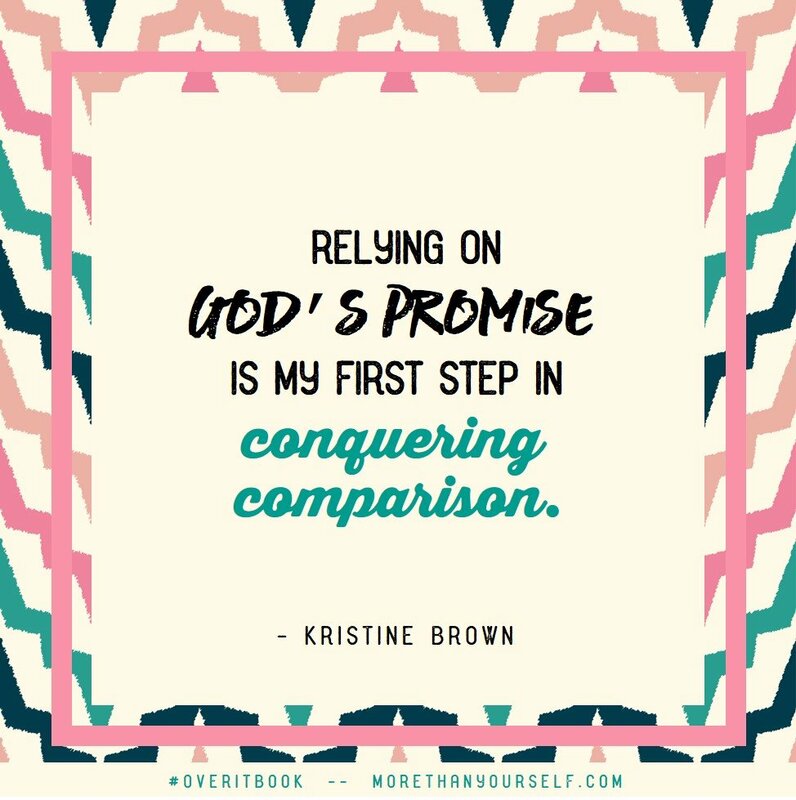 Through her wise counsel, Kristine helps us see how comparison is like a cancer to our destiny. She covers our hearts with Scripture and uses questions at the end of each chapter to help us reflect on our feelings and the truths we are learning. Yet, what stayed with me most is her quote above (page 133) – the stopping you in your tracks, the keeping you quiet, and not doing a thing to follow your hopes and dreams – fear of being prideful. It holds my feet down like I stepped in some gumbo mud. Every stinkin time I begin to think I am pretty good at something, that old enemy of ours, Satan, reminds me to be careful. He doesn’t have to say much. Once he plants just a little doubt into my motives, I feel crippled. Have you ever felt this way? Are you like me, and get confidence and arrogance confused? The Apostle Paul is a great example of arrogance versus confidence, “…though I could have confidence in my own effort if anyone could. Indeed, if others have reason for confidence in their own efforts, I have even more!”( Philippians 3:4) He had an ironclad pedigree as a Jew. He had reason to boast in himself. For me, confidence comes when I accept that the Holy Spirit will empower me to do what He wants done. If I’m good at anything, it’s because God has given me the ability. Most of us can spot arrogance a mile off. It’s spread pretty evenly in believers and non-believers. The struggle will always be there. We can be confident. We need confidence to accomplish all God has planned for our lives. As long as we lay our confidence humbly at Jesus’ feet. Meet my friend Kristine Brown. 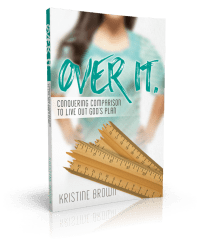 Her book (the cover is beautiful), Over It, Conquering Comparison To Live Out God’s Plan is worthy of a spot on your nightstand or your book list. Kristine is a writer, dramatist, and teacher. 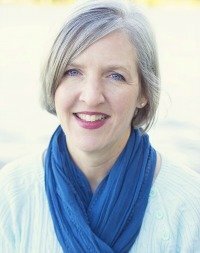 She helps women and teen girls navigate the ups and downs of real-life. Kristine devotes her time to family, freelance writing, and her non-profit ministry, More Than Yourself, Inc. You can read more from her at www.morethanyourself.com. 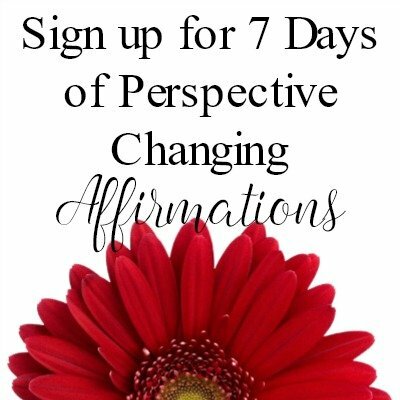 Connect with Kristine on Twitter, Pinterest, Facebook. Yes! If we lay our confidence humbly at Jesus’ feet. Amen. I agree Kristine, laying it down is absolutely a must. So much wisdom here, my friend! But this: “If I’m good at anything, it’s because God has given me the ability.” Amen! We are everything with Him and nothing without Him.